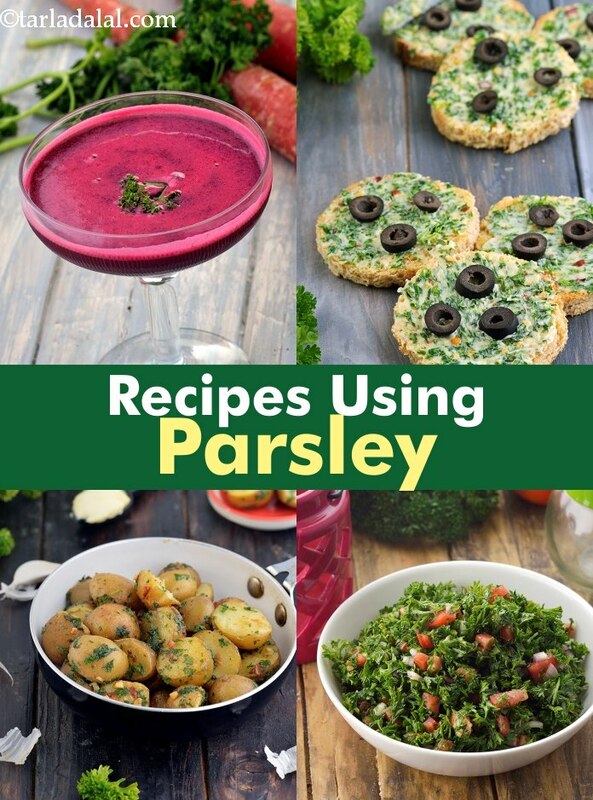 parsley recipes, Indian Parsley recipes. Parsley is the world's most popular herb – and it deserves to be, because of its awesome taste and inviting aroma! The name parsley is derived from a Greek work that means ‘rock celery’. It is probably called so because the biennial plant is erect, with a fleshy aromatic tap root and dark shiny leaves which rise from a short stem. Its aroma makes it a popular garnish for soups, pastas and other dishes. Parsley is healthy and nutritious, and is now available commonly in India. You can find it in the greens and herbs section of the supermarket from where you pick up coriander, curry leaves, mint etc. Once you bring home your parsley, take a few minutes to prepare and store it. Remove the wilted leaves, if any. Air it on a kitchen towel for a few minutes and then store in the refrigerator in a plastic bag. You have to ensure that the parsley is not wet before placing it in the bag, because wetness causes the parsley to spoil very fast. My favourite Indian parsely recipe is parsley and cottage balls recipe. This cold snack is ready in minutes and involves a simple procedure of rolling balls of a paneer mixture into chopped parsley and refrigerating for an hour. This is a perfect starter for a summer garden party. You can include parsley in many forms in your food, not only as a garnish or flavouring agent, but also as the main recipe sometimes, like in the case of certain soups and dips. Parsley and potatoes are made for each other. So, you ought to start off with the Indian Parsley Potatoes, but do also try the hummus and rice preparation using parsley, because they have a unique flavour that teases your taste buds and makes you lick your fingers! The pleasant herby taste of parsley complements the mild tang of yogurt beautifully, and together they make a wonderful spread for sandwiches. You can also use parsley to make a salad dressing because any salad can do with a herby touch, and so also sandwiches! For its health benefits and flavour, parsley is often used in nutritious juices, soups and salads. These definitely classify under the must-try category! Once you get used to the flavour of parsley, we are so sure that you will include it in your weekly veggie shopping list just like other herbs like coriander and mint. Feel free to experiment with this peppy ingredient – you can even try adding it to your Indian curries and parathas! Why not? Just go for it! Parsley : Parsley is a fairly good source of calcium, which is definitely known to support bone strength. Adding parsley to you meals daily will help you build your red blood cells count and haemoglobin levels and overcome anaemia. A glass of parsley juice is a very good detox to flush out toxins from your body and fight kidney stones. A cup of freshly chopped parsley fulfils your days requirement of vitamin C and vitamin K and folate. Parsley is part of Heart-friendly foods. See detailed benefits of parsley. Enjoy our parsley recipes, Indian Vegetarian Parsley recipes below. A herby snack made of flour perked up with chopped onions, curry powder and a generous dose of aromatic parsley, these parsley straw may either be served fresh or stored in an airtight container for a few days. Make sure you serve it with a nice, tangy dip for double joy! This interesting dressing of parsley, mustard and honey spiked up with a dash of pepper, features a wonderful balance of flavours and textures, and fits well into any salad or sandwich creation.